Stock status is current as of 4/25/2019 8:30 PMET. 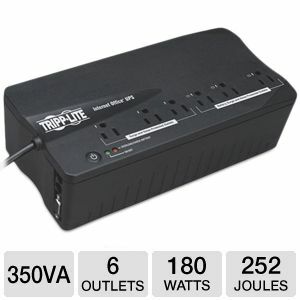 Avoid data loss during power shut downs using the TrippLite Internet Office UPS. This UPS is an essential device to ensure that there is no data loss in your system. Coming with 6 Outlets, it lets you plug your computer, monitor, printer and other peripherals with ease. The 252 joules surge suppression secures the computer from power fluctuations and 350VA /180 watt power keeps your PC systems working even after the power turns off so as to shut it down safely. It comes with a 6 ft. AC power cord for a convenient placement of your devices and also includes Battery Power Status LEDs to update you on the battery status. Buy the TrippLite Internet Office UPS.